The 2017 Alfa Romeo Giulia Quadrifoglio is Alfa Romeo's first mainstream sedan offered in the U.S. market since the 1995 164. It’s 1923. Race car driver Ugo Sivocci, tired of finishing behind his fellow drivers, paints a four-leaf clover on the side of his race car prior to competing in the Targa Florio, an open road endurance race held in Sicily. Strangely enough, the gambit works. The quadrifoglio, or four-leaf clover, brings him luck and Sivocci wins the race. All Alfa Romeo Giulia come with an eight-speed automatic transmission, along with a full slate of safety gear. A few weeks after his victory, Sivocci is killed when the new Alfa Romeo he is testing crashes at the Monza racetrack. Missing from the car – a quadrifoglio. No one had thought to apply his good luck charm due to time constraints. In the aftermath of his death, the four-leaf clover became the symbol for Alfa Romeo race cars and high performance vehicles. But while Sivocci’s quadrifogli were always bordered in a square, after his death, Alfa Romeo began encasing the four-leaf clovers in triangles, the missing point symbolizing Sivocci’s passing. Few know the quadrifoglio’s origin story, but brand loyalists lust for Alfas that wear them nonetheless. No wonder. Consider the 2017 Alfa Romeo Guilia Quadrifoglio, the car company’s first mainstream sedan offered in the U.S. market since the 164 in 1995 and the first of a new line of vehicles built on an all-new rear-wheel-drive platform dubbed Giorgio. It’s the most powerful production car ever built by Alfa Romeo thanks to its Ferrari-derived turbocharged V-6 rated at 505 horsepower and 443 pound-feet of torque. The base price is $72,000. With a zero to 60 mph time of 3.8 seconds and a top speed of 191 mph, the car wears all of the high-performance accoutrements one would expect: unique front and rear fascias; a hood, roof and driveshaft all made of carbon fiber; a torque vectoring differential; a high-performance Brembo brake caliper system; adaptive suspension; and 19-inch Pirelli P Zero Corsa high-performance tires wrapped around forged alloy wheels. Aiding and abetting the car’s performance gear is Alfa Romeo’s drive mode selector, this time featuring four modes rather than the three found in lesser Alfas. The added mode? Race, which is easy to understand once you experience the Quadrifoglio. It’s a stunning sports sedan with a quick, lively feel that keeps you grinning every minute you’re behind the wheel. Its balanced handling and proper sports sedan manners ensure that the Quadrifoglio goes where it’s pointed. Steering is quick without being too fast or twitchy. And the noises it produces guarantee you’ll never listen to the radio. Of course, this car stops as well as it starts thanks to the Brembo carbon-ceramic brakes: 15.4-inches up front, 14.2-inches in the rear. The results are impressive, with a 60-to-zero mph stopping distance of a mere 102 feet. And while the Giulia Quadrifoglio gets all of the attention, there are two other Giulia models: a base Giulia and the Giulia Ti powered by an all-new 2.0-liter direct-injection all-aluminum, 16-valve, turbocharged and intercooled four-cylinder engine. Designed specifically for Alfa Romeo, it’s rated at 280 horsepower and 295 pound-feet of torque and speeds you to 60 mph in 5.1 seconds. The engine is available with an all-wheel-drive system that can send up to 60 percent of the engine’s power to the front wheels. 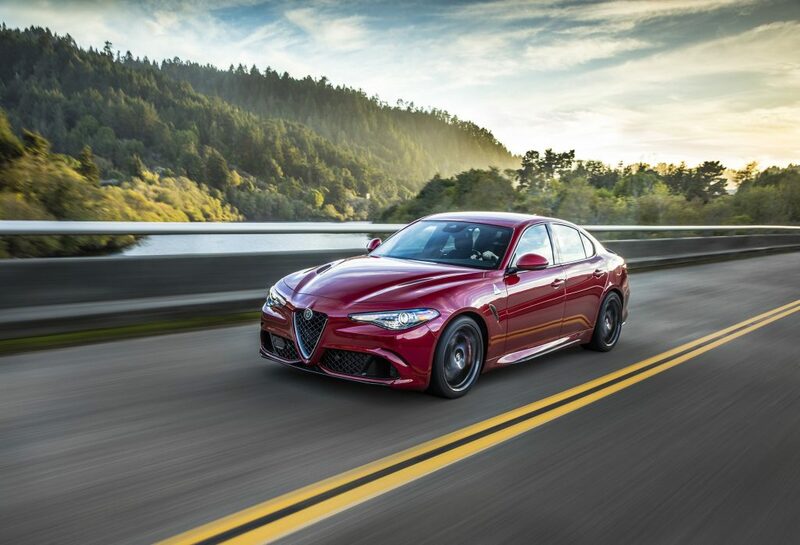 All Giulia come with an eight-speed automatic transmission, along with a full slate of safety gear that includes forward collision warning, adaptive cruise control, lane departure warning, blind spot monitoring, rear cross path detection, rear view camera and parking sensors. Inside, an asymmetric instrument panel is anchored by an infotainment screen measuring 6.5 inches, which grows to 8.8 inches when the navigation package is ordered. The instrument cluster is dominated by two large white-on-black face analog gauges with trim bezels accented in aluminum, wood or carbon fiber. It’s an irresistibly alluring package, one that makes you realize that regardless of which 2017 Alfa Romeo Giulia you buy, the brand’s signature quadrifoglio is apt: Owners of these cars are lucky to be driving such entertainingly athletic machines.